^ Plantago+major. Germplasm Resources Information Network (GRIN). USDA. [16 December 2017]. ^ As a result, Plantago major has many common names. 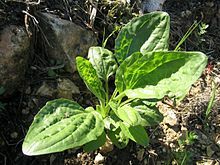 In addition to "broadleaf plantain" and "greater plantain", other common names include: common plantain, broad-leaved plantain, cart track plant, dooryard plantain, greater plantago, healing blade, hen plant, lambs foot, roadweed, roundleaf plantain, snakeroot, waybread, wayside plantain, and white man's foot prints. -- Britton, Nathaniel Lord; Addison Brown. An Illustrated Flora of the Northern United States and Canada, Volume 3 second. Dover Publications, inc. 1913: 245. ^ Botanical Society of Britain and Ireland Database 互联网档案馆的存檔，存档日期2007-08-08.